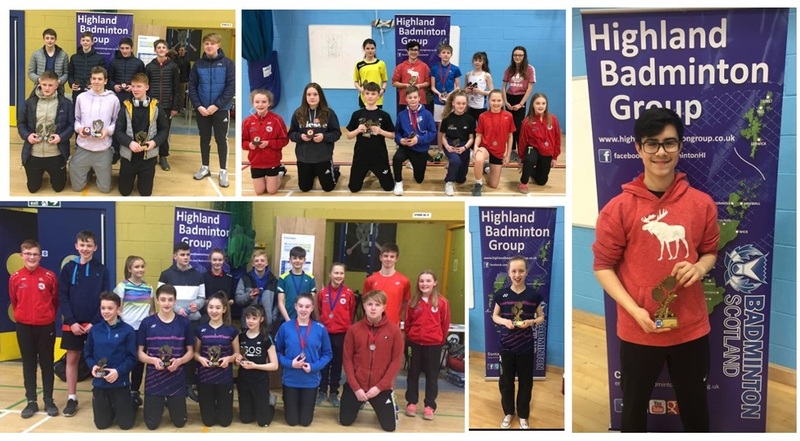 On Friday 8th and Saturday 9th February the Black Isle Leisure Centre hosted the Highland U17 Championships then on Sunday 10th February Inverness Royal Academy hosted the Highland U14 Championships. Over 90 Players travelled from all over Scotland and the Highlands to compete for the singles, doubles and mixed titles. Callan Short from Nomads (Dundee) picked up the U14 titles in all 3 events. Iona Muir picked up singles and doubles titles in the U14 who also competed in the U17 singles event to pick up the B Plate. Eva Tremble (Irvine) picked up the doubles and mixed title in the U14. There was some high-quality games throughout the Friday and Saturday. The boys final saw a terrific battle with Joseph Carlyle and Callum Stokes coming out with the win over Lewis Hart and Isaac Weir. The 3rd place play off the Ashly Donald And Sophie Ford was also one to watch going all the way with Ashley just pipping Sophie. There were strong performances across the 2 halls. Callan Short and Iona Muir both successfully picked up their titles in straight sets. There was a battle in the boys doubles semi-finals with Erlend Ballantine and Alex Thompson winning over Archie Baxter and Reuben McFarlane in a tough 3 sets. Many thanks to all players for their hard work, to all parents for their commitment to get their young players to the event, to the Black Isle Leisure Centre and Inverness Royal Academy for allowing us to use their facilities; and, most importantly to all volunteers who freely give up their weekend to ensure these events can be put on: Margaret Campbell, Andrew Durrand, Caroline Brown, Lesley Gordon, Ian Campbell, Duncan Grant, Aaron Habberley, Tracey Gough, John MacCulloch, Emma Donald, Eion Ballantine. Please note: decisions had to be made on the day to ensure smooth running of the event (mostly U17); we are trying our best to be fair and ensure every player gets as many games as possible. If you are interested in getting involved in your own local tournaments I am sure badminton Scotland will put you in contact with your area group so that you volunteer to help – I am sure they would be grateful of it.